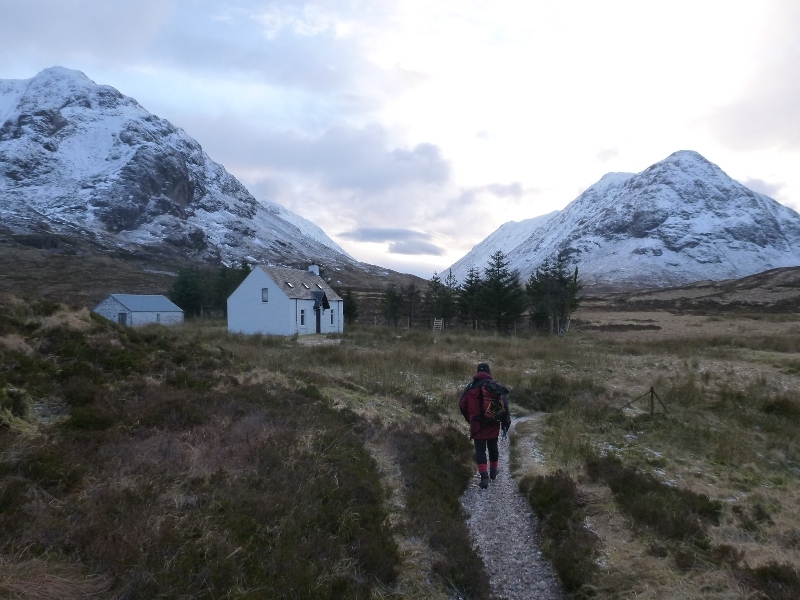 From the 11-14th February, the club headed to the SMC's Lagangarbh hut, sitting at the head of Glencoe beneath Buachaille Etive Mor. As we made the drive north on the Thursday night, a promising weather forecast and good winter conditions meant things were looking good for the weekend. The gamble to book for 3 nights and take a day off work for a long weekend looked like it may pay off, and we weren't disappointed! 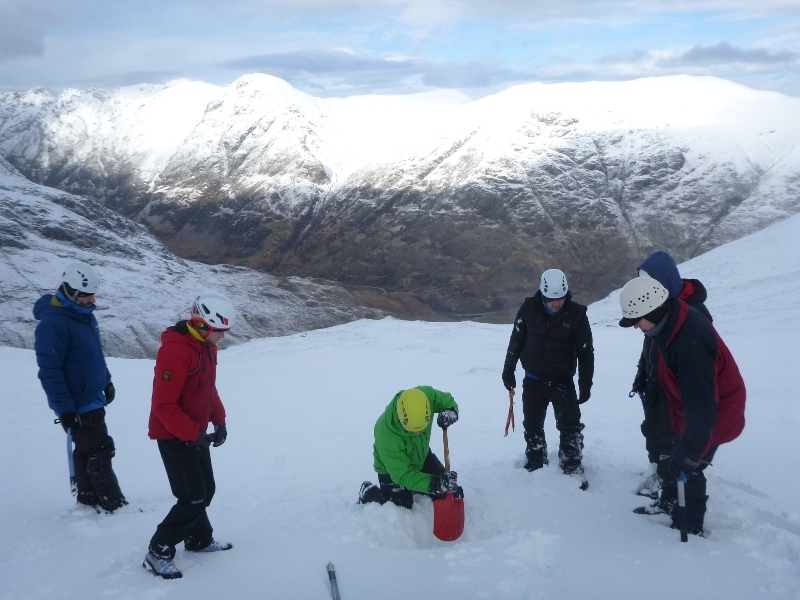 On Saturday and Sunday a few of us were booked onto winter skills courses (see separate post) that the club had organised. 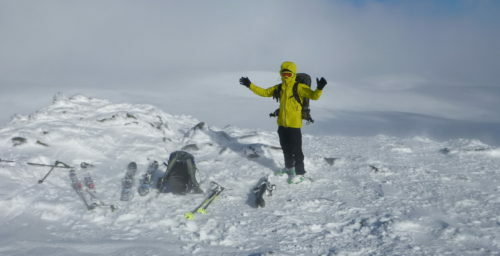 everyone was free on the Friday though, so we were all keen to get out into the snow and make the most of the good conditions. 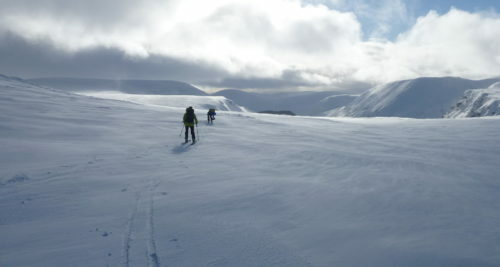 Peter, Dave, Mike, Warwick and Jake headed to Glencoe mountain for a day on the slopes. 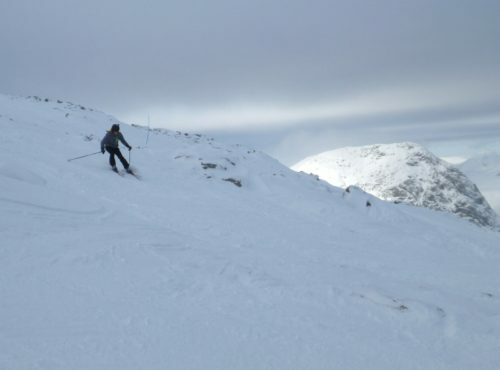 The cloudbase remained high enough to give some great views across Rannoch moor to the mountains beyond, and some nice powder on the slopes made for a good day's sliding. Peter tried out his new touring skis with a bit of skinning later in the afternoon before all retired to the Kingshouse hotel for an apres-ski pint. 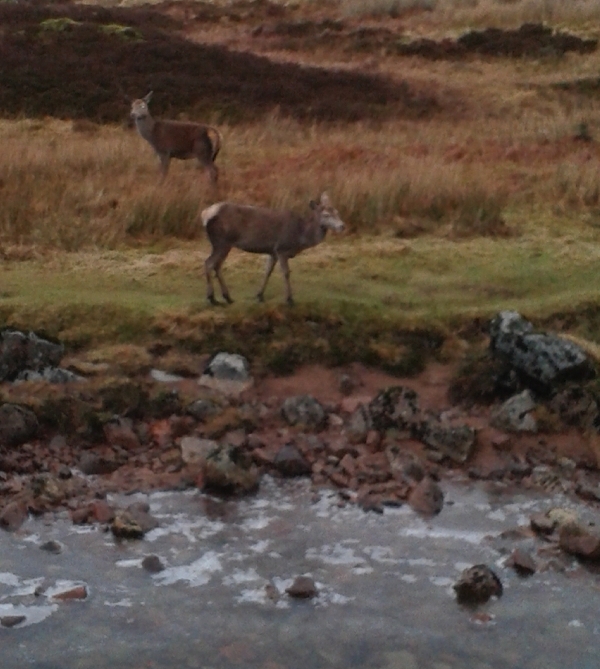 Leaving the bar, a couple of red deer were happily hanging out just across the river. 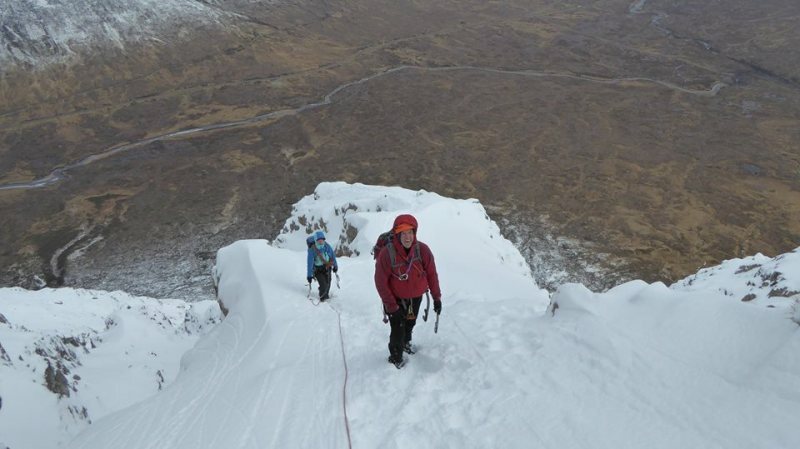 While some were skiing, a winter ascent of Curved ridge (II/III, 3) on Buachaille Etive Mor right behind the hut was the objective of most of the rest of the group. 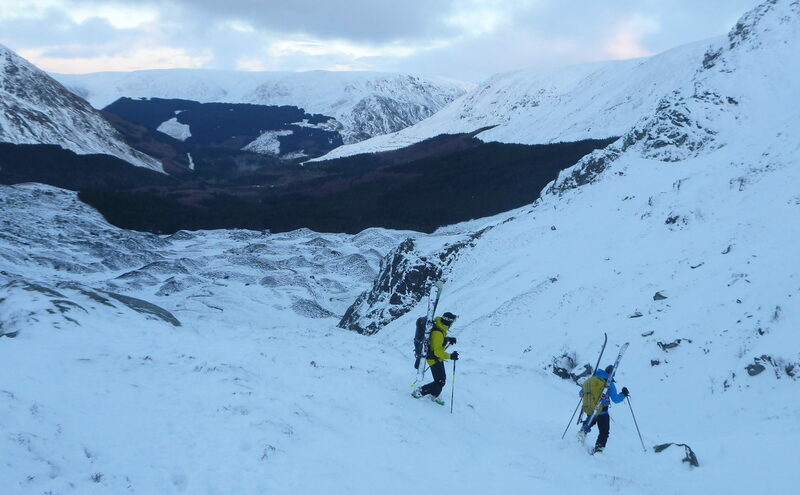 The fresh powder that the skiers were enjoying was probably less than ideal for the route, however everyone enjoyed the day out and the settled conditions. On Friday night, the day's stories were shared over the obligatory YAC feast, before Graeme Ettle, our Guide for the weekend's winter skills courses arrived. He had a chat to the group and outlined the plan for the next couple of days. Saturday dawned clear and cold, and Peter, Warwick, Mike, Jake, Jamie and Dave headed out with Graeme for the winter hillwalking course. Buachaille Etive Beag from the Lairig Eilde side being the chosen location for the day's activities. 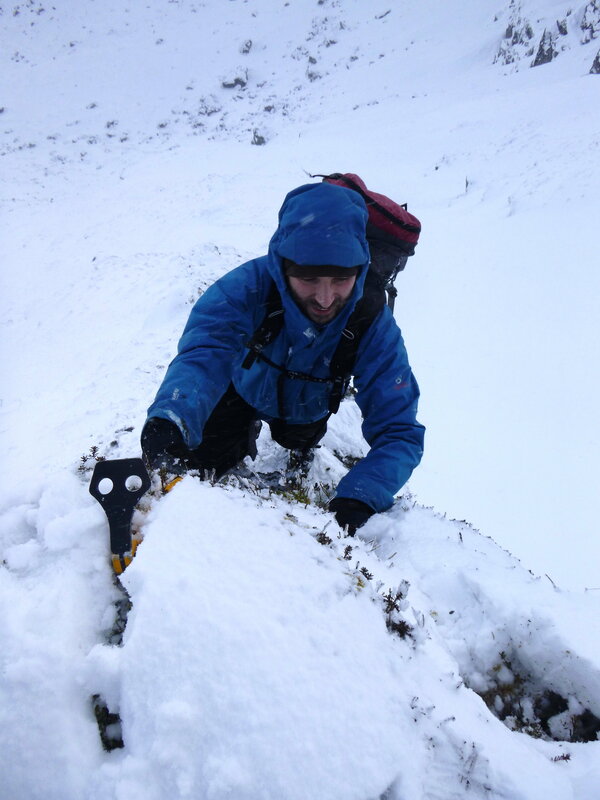 Richard, Rob, Paul and Mark headed up the same valley to Sron na Lairig (II) leading up to the SE ridge of Stob Coire Sgreamhach for a good route and an airy finish, while Simon and Carmen headed off to ascend Ben Starav and also add a couple of tops to their ticklist. 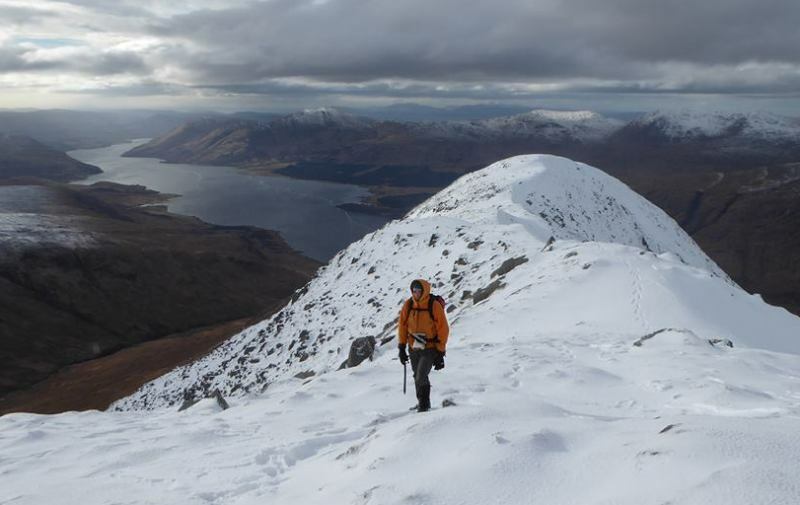 Graeme S headed out along the ridge of Buachaille Etive Mor. Unfortunately Liz was feeling pretty ill so opted to stay at the hut for some R&R, working her way through a book. We woke on Sunday scarcely believing our luck, as the high pressure remined over Scotland, bringing a third day in a row of cold, clear weather. The weather was due to change later in the day, so people were keen to head out early and make the most of it. Day 2 of the course was more focussed on rope skills for mountaineers, so Jamie, Mark, Mike, Warwick, Carmen and Peter headed off with Graeme to Nevis range to make use of the climbers Gondola up to Aonach Mor. Warwick decided the picturesque drive through Glencoe and along Loch Linnie was worth doing twice that morning by leaving his boots in the hut. Liz was still feeling under the weather, so made an early exit back to York with Richard. Graeme, Jake, Dave and Simon headed off to the Corbett of Stob Dubh for some more excellent winter walking conditions and great views. Back at the hut after a third great day out in a row, there was enough of Warwick's chilli left over to feed everyone with tea before setting off for the long drive south after an excellent weekend. 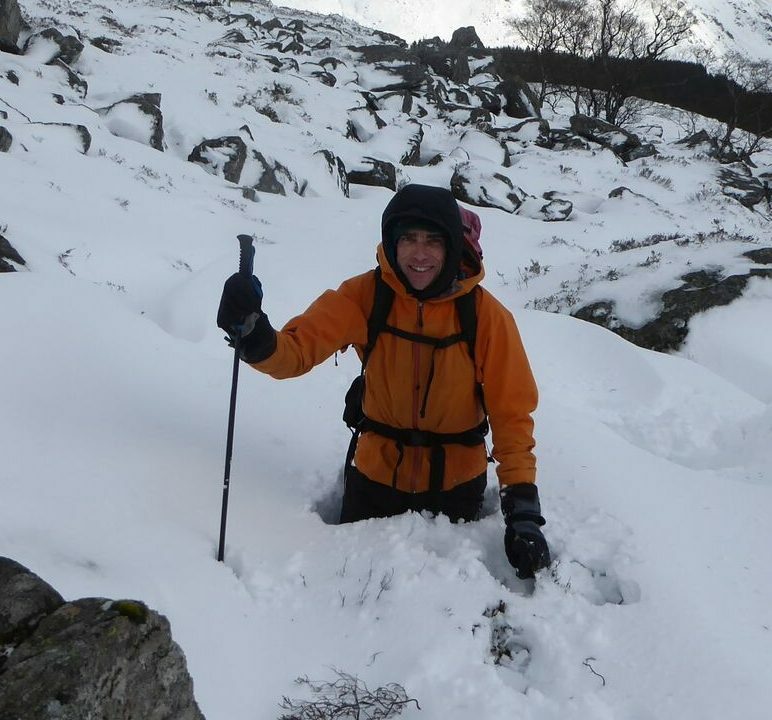 We had been really lucky with the weather, some of the club had consolidated existing knowledge or learned new skills on the winter courses, and the evening meals and company in the hut had been excellent as always. 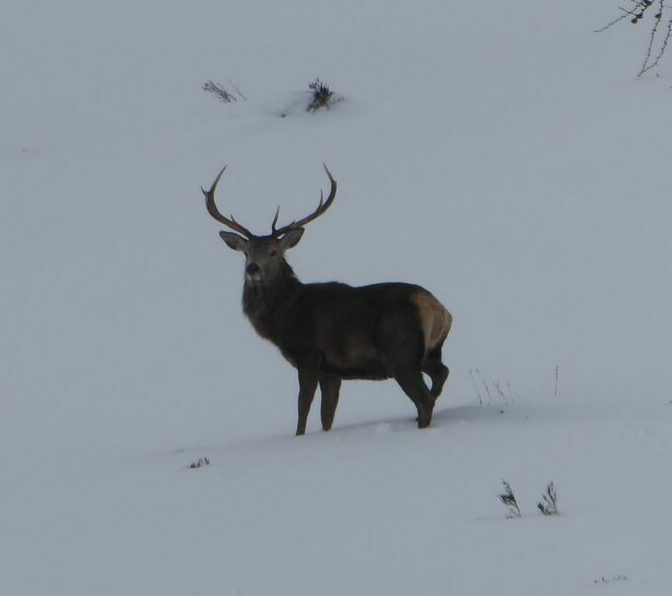 Sadly the weather we'd been lucky to enjoy all weekend had a sting in it's tail. As the weather finally broke, blizzards and a closed A1 on the way home made for some interesting driving conditions, and a much longer journey than planned for some. Portland, Oregon was the location for this year's CVPR conference which I was lucky enough to attend for work. Arriving on Friday afternoon and having Saturday free, I decided to go on a bit of an adventure. 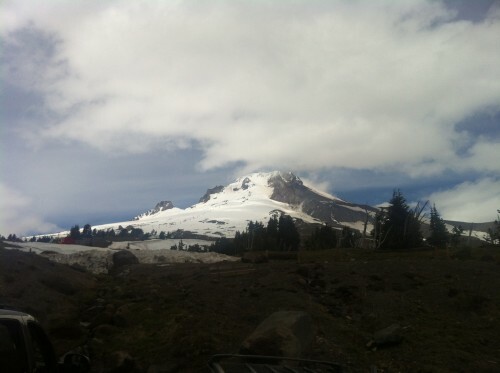 The most obvious objective from Portland is Mount Hood, the highest mountain in Oregon at 3,429 metres and one of the most climbed glaciated peaks in the world. 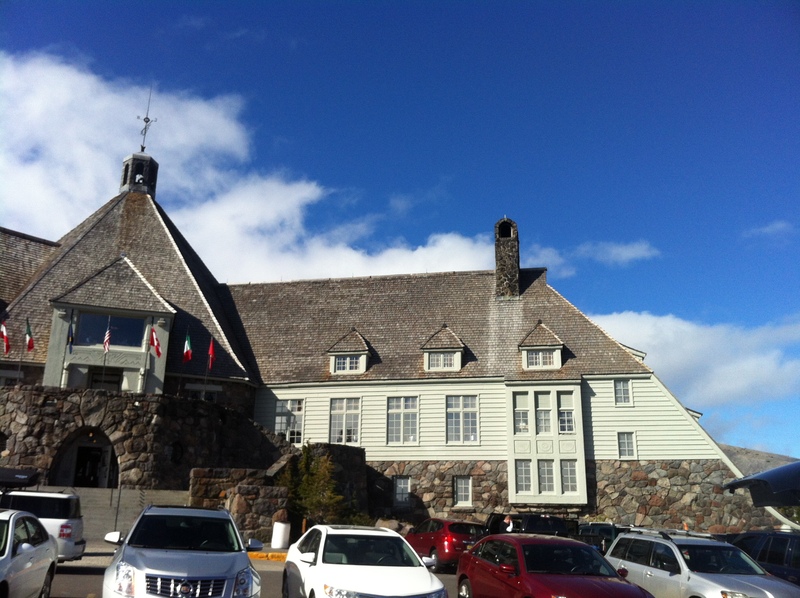 It is usually climbed from the Timberline Lodge ski area. Timberline Lodge was used for the exterior shots of the Overlook Hotel in The Shining and is certainly an atmospheric place. With no partner, the only option was to book a guide. 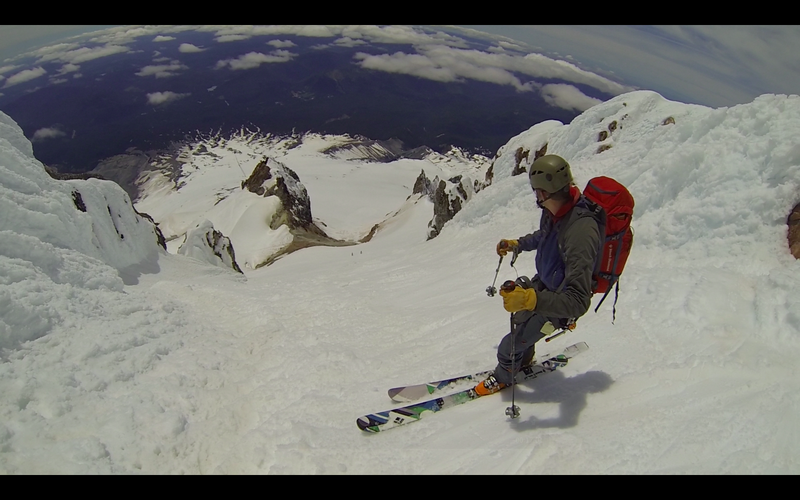 Unfortunately, the guides for Mount Hood get booked up far in advance, especially on a Saturday. 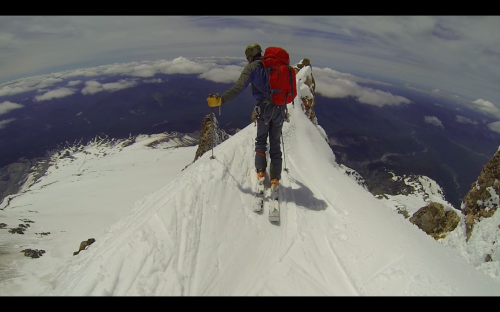 So looking for other options, I found an introduction to ski mountaineering course, also run on Mount Hood. The guy I spoke to said a descent from the summit of Mount Hood would only be possible with some experience of steep backcountry descents. When I met my guide John Mackinnon (ancestors from Skye – good stock for a mountain guide!) 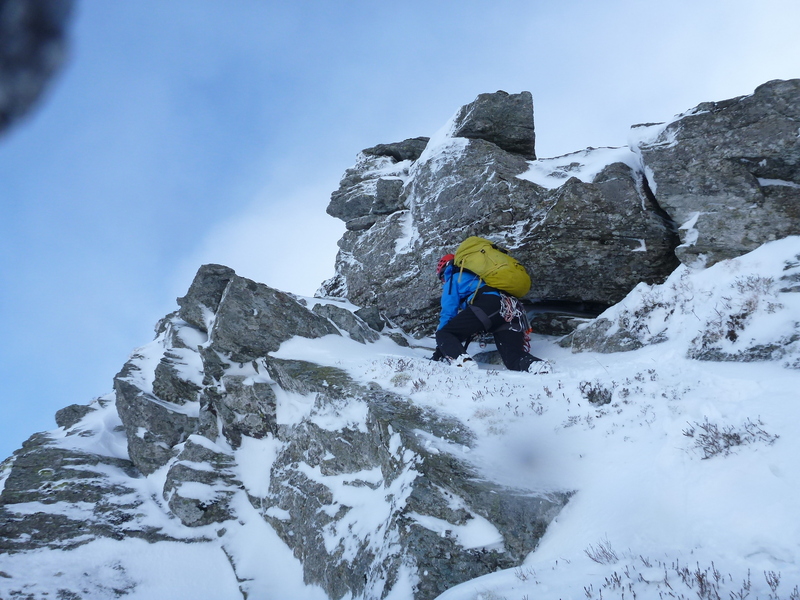 he was up for heading to the summit on the basis we could down climb if I didn't like the look of the descent. After a leisurely start, we were at the top of the chairlifts for 9am. The first few hundred metres of ascent gave an opportunity to practice steep skinning technique (difficult where icy!) before we switched to crampons. Flat foot technique in ski boots is tricky but front pointing is brilliant as the boots are so rigid. 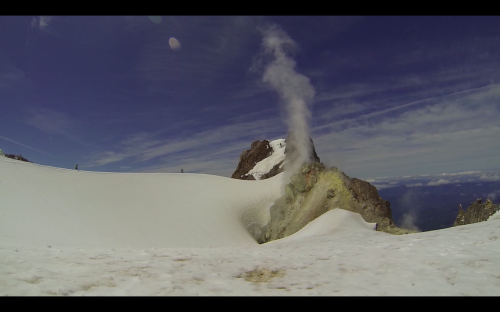 Mount Hood is volcanic so once at the crater rim, sulphur spews from the ground giving a pretty grim smell. Combined with the altitude, the effect makes you pretty lightheaded! From the crater, the slopes to the summit are about 45 degree snow with a short icy gully to finish (lots of other steeper options are available to the right). The views from the summit were incredible with a perfect inversion and lots of the other cascades visible including Mount Jefferson, Mount Rainier and Three Sisters. We took 3 hours from the top of the chair lift to the summit but that was in perfect weather and on skis. It felt about the same as a typical munro in winter but with the added effect of altitude and as the whole peak is glaciated, potentially crevasses. The climb is no more than Scottish grade I. 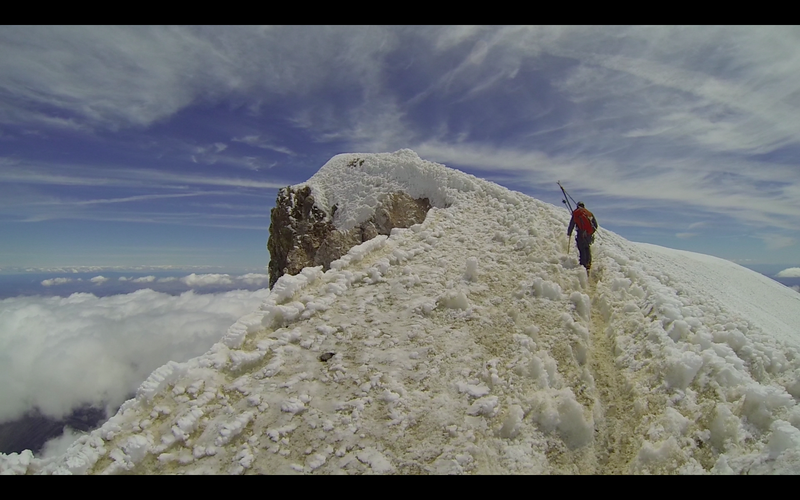 Now just the small matter of skiing back down! We put skis on and sideslipped the narrows at the top (I'm sure gnarlier skiers would have straight-lined it!) As soon as the first turn was out of the way, the perfect corn snow made for brilliant skiing. 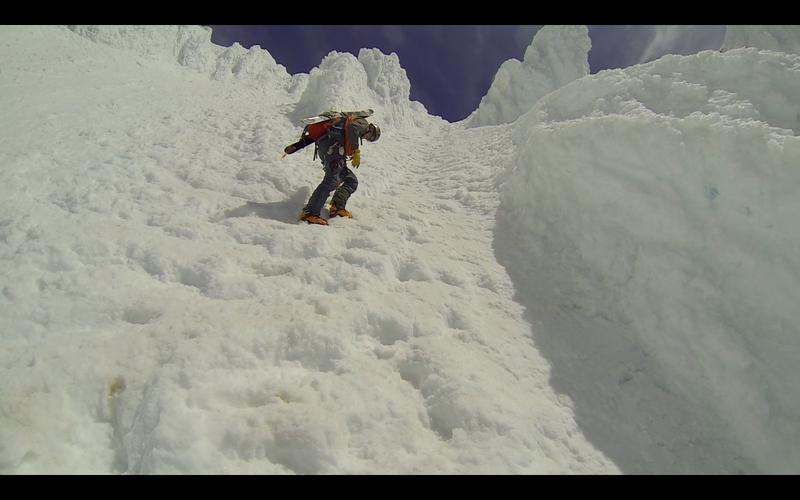 John recommended an even steeper section (around 50 degrees) leading to the zig zag glacier. 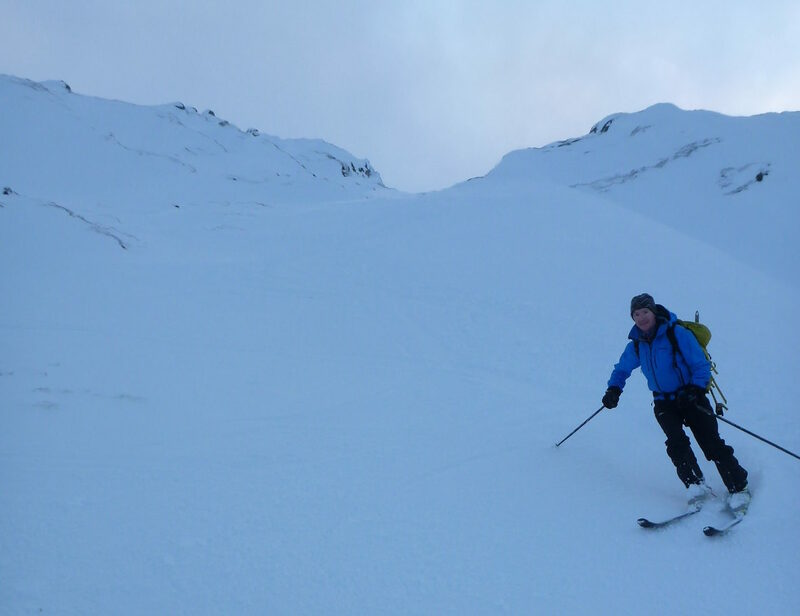 After lots more side slipping and some attempts at jump turns, we emerged onto the zig zag glacier to find acres and acres of untracked perfect snow. Miles of hero turns followed with the snow holding out all the way back to the car park. What a brilliant way to spend midsummers day! We skied from the summit to the point I took this photo! You are currently browsing the archives for the Ski-ing category.